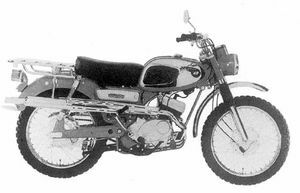 The Kawasaki F2 was a single cylinder street motorcycle produced by Kawasaki and sold between 1966 and 1967 in both a street and a trail version. 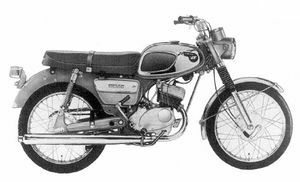 The 175cc two-stroke engine produced 18 hp @ 7,000 rpm and featured rotary disc valve induction and 4-speed rotary shift. Remarks: Successor to the F1, with different type of engine, rotary disc valve, and Superlube System. Remarks: Trail version of the F2 with knobby tires, electric starter, and skid plate.